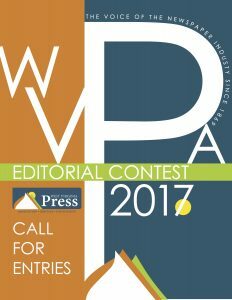 CHARLESTON, W.Va. — The West Virginia Press Association’s 2017 Newspaper Contest entry packets for editorial and advertising are available and the contest website is open for entries. Every August, the West Virginia Press Association sponsors a statewide convention for newspaper staff members around the state. Benefits include professional development workshops, awards to the best work in editorial and advertising from the previous year, and the ability to network and share ideas with colleagues near and far. This year’s convention is scheduled for Aug. 3 – 5, 2017, at Canaan Valley Resort in Tucker County, W.Va. Watch for updates and convention packets. The Advertising and Editorial contest information for 2017 is available here in a downloadable PDF format. For more information, questions or the association code, contact Don Smith at 304-342-1011, or donsmith@wvpress.getboho.com.